Alaska is a continent to itself. Its name means “great land” in the Aleut language. It’s part of the USA but it does not share (as for Hawaii) borders with the group of the other 48 states. It is very far from them also from a climate and geographic point of view. To reach it by land you have to cross Canada as it is positioned in the north-western extremity of North America and borders to the north with the Arctic Sea and to the west and south with the Pacific Ocean. Planning a motorcycle trip in Alaska is not impossible provided you evaluate carefully timings, routes, equipment, reference areas. This territory is enormous: around 10 times the average surface of the other 49 states; living there is difficult: think that of the 311 million people in the USA, only 800 thousand reside in Alaska, half of which are in the metropolitan area of Anchorage (but which is not the capital). Important cities with over 10 thousand dwellers are only 5: Fairbanks, College, Juneau, Kodiak, Ketchikan. In contrast to these figures there’s the extension of these urban areas which sees, in the US context, three cities of Alaska at the top positions. If you cannot resist the call of this ‘frontier land’, know that tourism is expanding and it is not difficult to find a guide or organisation to rely on. The motorcycle routes are many, but you must know them. According to the experts apparently there is no other place on Earth that can make you feel so close to nature. In Alaska there is the highest mountain of the USA: mount Denali, which reaches 6,194 metres. Our advice – if you are not a great expert of travelling in territories with extreme weather conditions – is to stick to the well signalled itineraries on the south coast and immediately after the Canadian border. In fact it’s in the south that the road network is developed and there’s the Alaska Highway that goes to Canada. The scarcity of roads (which also touches the capital, more easily reached via plane or ship) is determined by the scarce population, the great distances, the natural surroundings which do not help in building major roads: the more north you go, the more the territory is covered in ice and snow for most of the year. A curious fact: not many know that the United States bought this territory from Russia in 1867 for only 7.2 million dollars… A real bargain considering that later Alaska (which became the 49th USA state in 1959) revealed itself to be rich in natural gas and oil and that today it has a florid fishing industry. It became the 49th state of the USA at the beginning of 1959. To enter in the United States, and so in Alaska, you need a passport. For Italians, but basically this is true for many European countries, there are two routes: ask for a visa or use the ‘travel without a visa’ option with the authorisation from ESTA (Electronic System for Travel Authorisation), which lasts two years or until the passport expires and can be obtained accessing ESTA via the Internet at this address: https://esta.cbp.dhs.gov. The ESTA Programme has undergone some important changes and restrictions following the American Congress’ approval of the ”Visa Waiver Program Improvement and Terrorist Travel Prevention Act of 2015”, law that contains new provisions for those who intend to travel in the USA without a visa. Measure to apply the law are still currently being implemented and under certain conditions this may affect also who has already obtained and ESTA, even if still valid. The only thing to do is contact the USA Consulate of your country and ask for updates. Restrictions may vary over time, so it is advisable to contact the Embassy or Consulate in your country. Since April 1st 2016 to enter the United States through ESTA, so without a visa, you must have an electronic passport, with microprocessor containing the biographic and biometric data of the holder. The travel programme without a visa allows you to stay in the STATES for no more than 90 days, having already a return ticket. Recognition of driving documents pertains to the single states and is not the same on all the American territory. Regarding Alaska, the Italian driving licence is valid for up to 90 days. It is still advisable to have also an international driving licence in accordance wiht the 1949 Geneva Convention. The free temporary importation of motorbikes (without customs documents) is allowed for a maximum of a year. Only policies emitted in Canada are accepted. Citizens from Italy and other countries who go to the Usa with their vehicle will have to take out insurance at their arrival. New York, N.Y. 10005 – e-mail ask.aiu@aig.com. In ALASKA motorcycles must have their lights on also during the day. The helmet is obligatory in most USA states, but in some only bikers under 18 or 19 must wear one. With regards to Alaska, the law says: obligatory – 18. There are restrictions on the use of motorcycles on toll roads and motorways, indicated on road signs at their entrance. It is prohibited to drive a vehicle under the influence of alcohol or drugs. The blood-alcohol concentration limit is of 0.08% in all States. Road check are many and arrests are frequent. Do not take this rule lightly. In case you get stopped, scrupulously follow the Police’s instructions: do not get out of the vehicle; keep your hands on the steering wheel; show the documents you’re asked for, etc. Generally speaking, in the USA you need to be particularly careful, especially during the evening and night, in some areas considered unsafe, in big urban centres. You must consider that the American work and social life finish earlier that the Italian ones and often city centres are deserted already around 6 pm. This is true also for Alaska. Try never to leave your bike unattended, nor easy to steal objects and accessories, or bags containing personal documents. Intensified security checks, in the context also of anti-terrorism, might mean longer times and greater difficulty in airport operations (check-in, passing through the metal detector etc. ), at borders, at the entrance of museums, public buildings, etc. In the case of problems with the local Police Authorities (being held in custody or arrested) we recommend always to inform the competent Embassy or Consulate for the necessary assistance. Excellent health facilities. As medical/hospital expenses in the United States are very expensive,before leaving it is advisable to take out medical insurance covering medical expenses and the possible medical repatriation or transfer to another Country. There are no particular illnesses in Alaska. Alakan cuisine: principally based on fish, there is a great variety of fish and seafood. Giant crabs. To try: elk steaks. The food, generally, is very fresh. TIME ZONE: 10 hours behind Italy. Daylight saving time is in force (except in a few States) and generally starts two weeks before and ends a week later than in Italy. The country has a mobile phone network. You can receive calls also with a foreign sim card. The main telephone service providers are : Verizon Wireless, AT&T Mobility, T-Mobile US and Sprint Corporation. Where to sleep: as in all the USA, there is no hotel classification. Here more than comfort what counts is where the hotels are located. It is not difficult to find lodging in private houses. If you’ve hired a bike it is possible to equip it with cases and screen paying a supplement. If the bike is yours the first thing to check are the tyres, which must be suitable and especially in excellent conditions. In any case, hired or own bike, you face Alaska with adequate clothing, able to maintain body heat even when temperatures go well below zero. Very important are gloves and boots, which must be waterproof and with thermal lining. A high-quality rain suit is also indispensable (let’s say able to sustain a pressure of an 8,000mm water column). Small accessories to take from home could reveal themselves to be incredibly useful, such as leg and hand covers. The small GIVI S180T universal spoiler appears ingenious, as you can attach it to the high part of many screens already mounted on the hired bikes, increasing the level of protection against the cold wind. Full-face helmet and a warm under helmet head cover are the rule. You will find yourselves in an unforgiving territory, the weather is changeable and you cannot risk remaining without petrol or travelling after sundown. Hired bikes, we were saying, can certainly be equipped according to your needs, but certain accessories are not easily found and taking some stuff from home is not such a great problem: a couple of soft waterproof bags, to fix with elastics or strips, can always come in handy; a tank bag that becomes a backpack, convenient during stops and where you can insert a hub connected to the 12 Volt plug of your vehicle, to charge the various electronic devices you need for your trip. Cold is an enemy of batteries. Then also various kits (first aid, puncture, multi tool and a good torch). Binoculars are not motorbike equipment but here you are not allowed not to have a pair with you. In Alaska octane rating 87 and 91 (MOZ) are US ones and correspond roughly to 92 and 95 octanes (ROZ) of other countries. The American gallon is equivalent to 3.785 litres. The average cost of a gallon (regular gas) goes from a minimum of 2.28 to a maximum of 3.95 dollars (prices as of the beginning of September 2016). Everyone knows that it’s very cold in Alaska. But actually the State divides the weather forecast into 4 different geographic areas with different climates. The South Coast has milder temperatures with averages in January of -3° by day and of 15° in July. But it’s also the area where it snows most. The West Coast has very cold winters (the Bering strait can freeze over), and chilly summers. 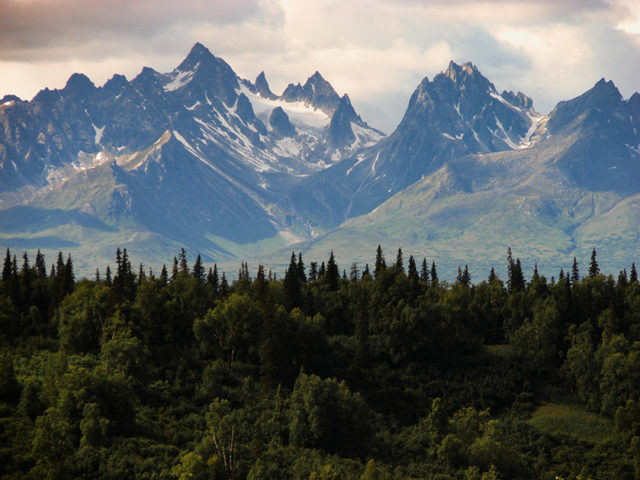 Summer is surely the season to choose for a tour of Alaska and the central-southern region, where most of the people live, the area to explore. In particular the mildest temperatures are between June and the end of August. This State is a huge National Park, with an astounding number of rivers and lakes: consider that around 3 million of them reach a surface of at least 8 hectares. going south you reach the Kenai peninsula, going north instead you meet the Mat-Su valley. If you are also rock climbers, besides being bikers, a visit to Talkeetna, where the ascents to mount McCarthy are planned, will surely be interesting. And in that direction you reach Alaska’s major national park: Wrangell-St Elias. The south-west is wilder. Attractions are the Katmai national park (with its over 2 thousand brown bears) and the Valley of Ten Thousand Smokes. You can easily reach the island of Kodiak by ferry. It’s also worth parking your bike and going on a tour on a hydroplane. And what about the chain of Aleutian Islands? If you look at the map of Alaska you’ll see them at the bottom, extending towards Asia. If you have more time and feel more adventurous, head for the Interior Region, towards Denali national park, which can be reached via the Parks Highway from Anchorage and Fairbanks, a city this which in summer has 20 hours of light a day. And you still haven’t had enough, there’s the Arctic Region, where the Eskimos live. Our advice is to go there for one or two days with a return flight to Coldfoot or Bettles. The web is full of organisations that can assist you simply by renting you a bike or by offering you group tours. Here are a few. Via del Ricordo 31- 20128 – Milan – Italy, Tel: + 39 – 02.2720.1556. Of the itinerary with lodging in B&Bs. A ride of 3,300kms (around 260 a day). 4 days of rest in the most important places. Tours organised with hired bike, local guide + support van. 12 days, 2,500kms, lodging in hotels, lodges and wood chalets. Difficulty level: easy. Bike rental and 9 different tours to choose from (on and off road) A really professional organisation. Open all summer. They have been renting motorbikes in Alaska since 1994 (real pioneers) and they are trusted partners of many tour operators. The name is that of a tour operator, but actually they are a motorcycle rental service + shop amongst the most well known. From the website you can download a pdf of the price list.